I have updated the article with a plot of the mean prices per vendor to see if there were some vendors that would be consistently more or less expensive. 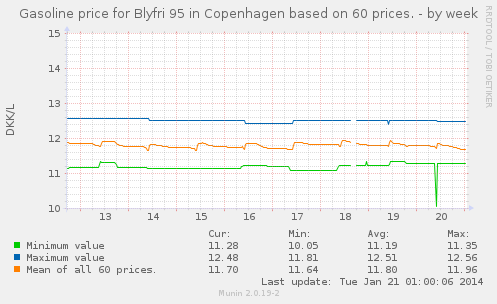 Munin is the perfect platform to sample these prices and show the time trends, so I wrote a simple python based plugin that scrapes the page for prices and calculates the min, max and mean prices. 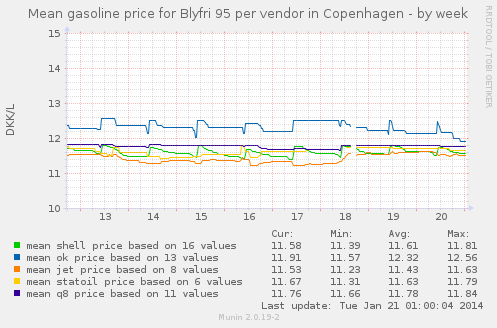 print "graph_title Gasoline price for Blyfri 95 in Copenhagen based on "+str(len(prices))+" prices." print "mean.label Mean of all "+str(len(prices))+" prices." # Print the values when munin calls the script. print "graph_title Mean gasoline price for Blyfri 95 per vendor in Copenhagen"
print vendor+".label mean "+vendor+" price based on "+str(vendornumber[vendor])+" values"
Looking at the data from the first week of running the munin-plugin it is clear that a daily sharp increase of the prices occurs daily at 10 am and is followed by a monotonic decrease until next morning at 10 am. The best time a day to buy gasoline in Copenhagen is hence just before 10 am in the morning. Once I have gathered data for a few months I might be able find out if there is a ‘best’ day of the week to buy gasoline, but I am unable to tell so far. Absolutely brilliant. It’d be interesting to see how much the rank of the gas stations change, i.e. is it always the same ones that have high or low prices. Ras: That’s a good point – If I get time next weekend I will make a version that does just that. 🙂 Data mining for the win! I’ll be using it in Aalborg.